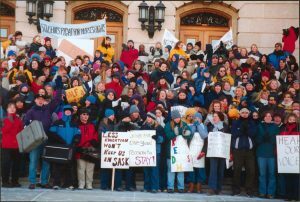 “Photo Students Legislative Building, Nursing Education 2004” by Saskatchewan Registered Nurses Association is licensed under a CC BY Attribution 4.0 International License. For more on advocacy, see the CNA’s webpage Policy and Advocacy. The short but comprehensive description of advocacy by the CNA requires the professional nurse to be aware of inequity and inequality within patient practice, among professional colleagues, and within local, national, and international communities. A simple example of inequity or unfair treatment within patient practice may include violations of best practice. For example, care of a complicated chronic ulcer demands a specialized dressing; however, a health care institution may not have the required dressing due to cost restrictions. Consequently, a less costly dressing is used and the healing of the patient’s wound is delayed. The knowledgeable and ethical nurse leader understands the consequences of inappropriate wound care and is prepared to take appropriate actions to foster best practice. The nurse leader is aware of the need for positive staff morale and spirit at work in the health care workplace. Contrary to the actions described in the phrase “nurses eat their young,” a successful nurse leader mentors new graduates, by including them as part of the team and working with other team members to support new team members in developing their full potential as professional nurses. The nurse leader’s awareness of health, well-being, and social justice extends beyond the health care workplace to his or her local, national, and global communities. The leader works to support healthy lives and well-being for people of all ages as stated in the United Nations sustainable development goals (WHO, 2015). The nurse leader may not work directly with every community; however, she or he can impact all communities indirectly through health-focused actions and communications within the local community. Advocacy requires the engagement or participation of multiple people. It is not a solitary act. It requires the nurse leader to communicate with others and involve the community in the development of plans and potential solutions to health-related problems. The nurse leader’s skills in accessing relevant research ensure that advocacy initiatives are constructed upon a foundation of evidence that provides strength to the community action. The CNA conducted an environmental scan in 2016 to identify the health care concerns of Canadians. Environmental scans capture key trends and issues that may impact the policy work and programs of CNA and its members, and thereby create awareness for Canadian nurse leaders. The findings are intended to inform the CNA board’s strategic decision making. Read the CNA’s executive summary of that environmental scan “June 2016 Environmental Scan Summary” and review the key health care trends and issues of Canadians. Select three themes from the CNA Environmental scan that you believe will have the greatest policy impact on the CNA. Justify why you chose these three themes.